When a group of assassins targets Bruce and Selina, Gordon and his allies must scramble to track them down. Gotham wrapped up the first half of its debut season by providing us with a mid-season finale that personified all of the strengths and weaknesses of the series so far. A few episodes ago, I decided to just go with the flow and try to enjoy Gotham for the kind of show it is, but there were certain elements of “LoveCraft” that I found a little bit too frustrating to overlook. It wasn’t a terrible episode by any meaning of the word, but I’ll be crossing my fingers that some of the show’s more glaring issues will be worked out during the mid-season break. The Bruce and Selina material was a lot better than in “Harvey Dent.” Their back and forth with each other felt a little snappier this time around, and their flight from the hitmen sent after Selina provided some decent action. The only drawback to their entire storyline this week was the fact that there was absolutely no danger involved. They were pursued by the ruthlessly efficient Copperhead and her gang of followers, but due to this being a prequel series, every one of our heroes involved in the chase was untouchable. Bruce, Selina, Gordon and Alfred are all major parts of the Batman story, so there was no way that they wouldn’t all be safe by the end of the episode, which kind of renders a large part of “LoveCraft” pointless. It wasn’t all bad on this front though, and the character that really shone through was Alfred. We’ve seen a few glances of his darker side throughout the season, and he was completely unleashed here with Bruce in danger. Not only did he have a cracking good brawl with Copperhead and her associates, he showed he was deadly with a gun in his hands and also had a classic “it’s just a flesh wound” moment after being shot. As I’ll discuss in a moment, Gordon was kind of off on his own for much of the episode, so it was left to Alfred and Bullock to team up. This partnership proved to be a lot of fun as we got to see their radically different approaches to each obstacle they faced. As I mentioned above, Gordon was a little isolated from the action this week. He found himself caught up with the search for Lovecraft and trying to rectify Harvey Dent’s ineptitude. After recent portrayals of Dent in Batman tales, it’s interesting to see him coming off as a bit incompetent here, as a risky ploy of his backfires, putting Bruce and Selina in danger in the first place. Gordon tracked down Lovecraft fairly quickly, but soon found himself taken out by Copperhead. The twist here, with Lovecraft shot with Gordon’s gun, is pretty standard fare for television. I’m not completely sold on the ramifications of this, with Gordon promptly finding himself reassigned to Arkham Asylum. On one hand, it does seem like a strange punishment for him, but on the other, it could also open up some more interesting stories for the show. The GCPD angle hasn’t always been the most entertaining, so perhaps the inmates and staff at the asylum will provide some much better plotlines. Cobblepot and our other favorite villains have had their time cut a little bit over the last couple of weeks, and that continued here. The material was still good however, with Falcone becoming increasingly suspicious of all those around him. Falcone has been mostly just threats so far, so seeing him take action into his own hands this week was a nice surprise. Casually shooting one of his lieutenants at the dinner table while continuing his conversation with everyone else there was a pure power move. It was also interesting to see Cobblepot keeping quiet about Liza, even though it would have put him in the clear with Falcone. Cobblepot is clearly playing the long game here, and he’s trying to gain as much intelligence on Mooney as possible before making his next move. 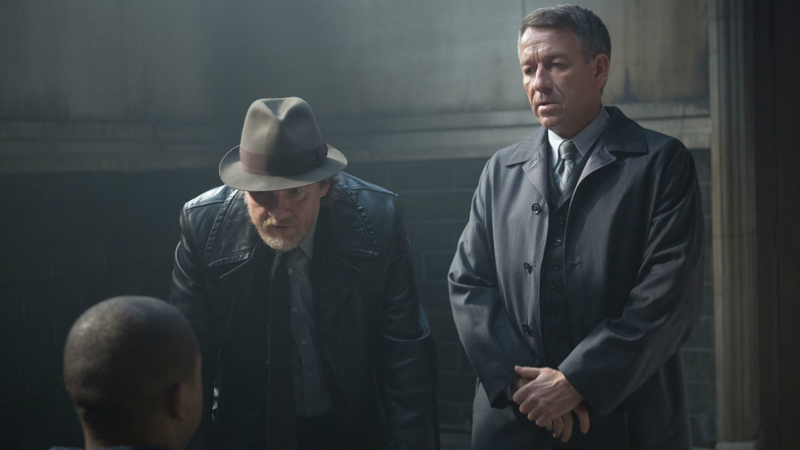 Gotham has been quite uneven in its first run of episodes, but there’s still the making of a pretty good show in place. There are a handful of charismatic villains in place as well, and the partnership between Gordon and Bullock looks like it can continue to grow as we go forward. There are plenty of negatives too, but the mid-season break provides the perfect opportunity to iron out some creases and make Gotham into a stronger show. While his move there seemed a little out of place, Arkham Asylum could prove to be the change of scenery Gordon needs to continue his work on the Wayne case, simultaneously injecting some new life into the show as a whole. Gotham may not be my favorite show on TV right now, but I’ll still be looking forward to seeing what they throw at us early next year. What characters would you like to see on the show now that the action appears to be shifting to Arkham Asylum? Let us know in the comments below.